Since the 1990s, wound care has taken a substantial leap forward. 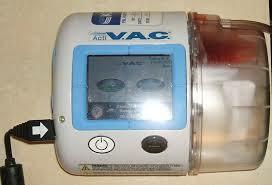 The new device was first marketed in the US by KCI (San Antonio, TX) in 1995 as the V.A.C. Therapy System. It efficiently provided a means to apply negative pressure (sub-atmospheric pressure) via the V.A.C. pump ranging from 50 to 200 mmHg to the wound beds of both acute and chronic wounds (wounds, burns ulcers, flaps and grafts) – thereby promoting wound healing. NPWT is contraindicated in the presence of exposed anastomotic sites, exposed vasculature, exposed nerves, exposed organs, necrotic tissue with eschar present, untreated osteomyelitis, non-enteric and unexplored fistulas, and malignancy in the wound. 1. Is the use of NPWT appropriate for the patient and the patient’s wound at this point in time? 2. Have device indications, contraindications, precautions and warnings been taken into consideration? Have other treatment options been considered and offered? 3. Are the members of the interprofessional wound team properly trained in the use of NPWT? 4. Has the physician ordered the device with appropriate settings and specifications (e.g. pressure in mmHg; continuous vs. intermittent; frequency of dressing change)? 5. Is appropriate and functioning equipment being utilized (e.g. pump, canisters, tubing)? 6. Have the correct dressing materials been ordered and utilized (e.g. foam, silver foam, contact layers, gauze, drapes)? 7. Have appropriate arrangements been made for use of NPWT across the continuum of care (acute care, long term care, home care, outpatient)? 8. Have arrangements been made for wound reevaluation to determine when NPWT can be discontinued? 9. Has the patient and his/her caregivers been trained in how to monitor the device, device alarms and what to do and who to contact in case of problems or emergencies? 10. Have the providers included appropriate documentation in the medical record? NPWT can be effective when used properly with the right patient. Misuse may result in patient harm.